Is there a better alternative to rekall? Is rekall really the best app in Inventory category? Will rekall work good on macOS 10.13.4? 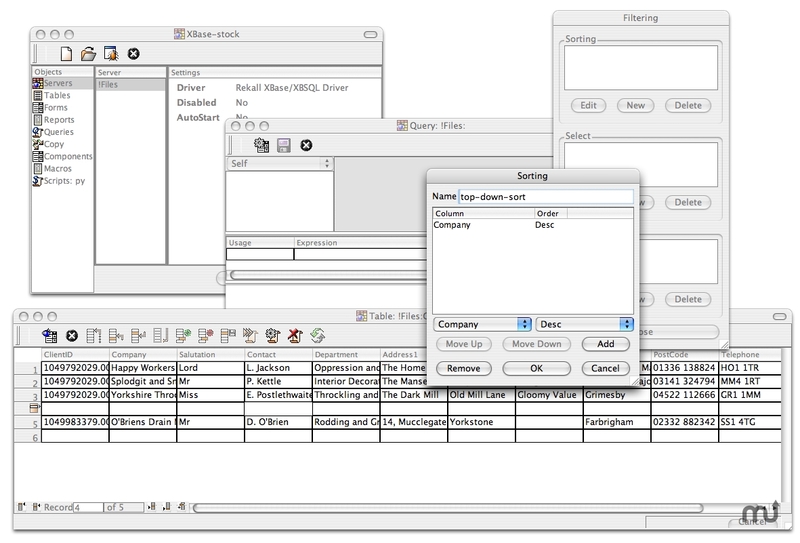 Rekall is a database front-end, somewhat in the style of Microsoft Access(tm). However, Rekall is not itself a database, and does not include a database. By this we mean that data is stored somewhere else in an SQL server, and Rekall is fundementaly just a tool to extract, display and update that data (of course, it does lots more than that, it does forms and reports and scripting and .... you get the idea). It is database agnostic, and does not have any preferred database. Mac OS X 10.3 or later, MacPython 2.4.1 (or any other Python 2.4.1 framework build), Trolltech's Qt/Mac 3.3.x C++ framework (download bookmarks for an installer of Qt/Mac and MacPython 2.4.1 are provided with the package). rekall needs a rating. Be the first to rate this app and get the discussion started! Rekall can do lots of the things that you would expect of a database front-end (or if it can't, let us know!). You can design and use forms and reports, you can construct database queries, and you can import and export data (actually, you can copy data, import is just copy file to table, and export is just copy table to file). You can also create reusable components which you can use in forms and reports, to reduce application development time. Rekall can be scripted using the the Python language. You can arrange that a script is executed when various events occur (for instance, when the user changes the value of a control). Scripts can be associated directly with the event, but you can also store scripts in script modules for more general use. And, of course, you have full access to all the modules that are available for Python. Plus, Rekall has an integrated Python debugger with syntax highlighting.